BT&T TELECOM GROUP CORPORATION is a privately-owned Delaware, USA corporation established in 1999. BT&T's vision is to be a key player in the burgeoning telecom horizon, whose energies and passion are focused in the Philippines, North America, Europe, Middle East and other Asia-Pacific countries. BT&T has opted to focus in packet-switch or Internet Protocol (IP) telephone technology because of its economy and toll-quality calls comparable to plain old-fashioned telephone system (POTS). Telecommunications technology is changing rapidly and you need someone to keep you up to speed. BT&T will provide you with services that will take you to the next-generation telecommunications era. Whether you need a solution to drastically bring down your telecommunications costs or a solution to help you tap the power of Triple Play platforms in video, data and voice, BT&T can make your MONEY work for you. 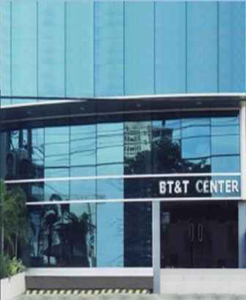 BT&T gateways facilities are co-located in major telcos in the Philippines. BT&T has direct white-route terminations to 99% of Philippine carriers. It has been granted by the Philippine National Telecommunications Commission (NTC) a license to engage in the VOIP business. BT&T is a 214 facilities-based carrier accredited by the US Federal Communications Commission (FCC). BT&T has a network presence located in New Jersey with interconnection facilities to more than 350 global carriers, worldwide. BT&T's communications platforms are extremely stable, consistent on a day-to-day basis offering 24/7/365 customer service support.